This post illustrates how a default navigation menu can be converted to use go link instead of command links. This will let users to use navigation tabs as simple links. 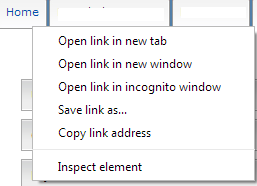 Users can then be able to use browser basic functions as right click copy, share, open the link in new tab. The navigation itself will have simple go links which are also SEO friendly. Now we cannot simply have a goLink instead of a af:commandNavigationItem that is because af:navigationPane supports only af:commandNavigationItem and if we keep using the commandNavigationItem then all the basic functions will not work. Also using a command navigation item makes an extra call before redirecting the user to requested page. Things to consider, we need to get the dynamic URLs from default-navigation model and also we need to handle parameters that might be defined with the URL. The following fragment code can be used instead of the standard pagemenudefinition task flow, of coarse you might want to create a TF out of it. Here we go, we not have a tabbed navigation which is much more like web 2.0 style. By now you should see the go links in your tab navigation and the right click should be working on the link itself but we would like to have the whole tab for right click. So you could add the following snippet. Rest all the css classes should already be present as part of framework.